Waste-to-energy is one of the most effective alternative energy options to reduce CO2 emissions and replace fossil fuels. It is not just a trash disposal method, but a way to recover valuable resources. Waste-to-energy is a vital part of a sustainable waste management chain and it is completely complementary to recycling. Over the last few years, renewable investments are focused on reducing worldwide dependence on coal and other fossil fuels. Several new waste-to-energy projects are being established across the world and they would start contributing to the global energy mix on a consistent basis in the next few years. Favorable government initiatives and policies are driving the waste-to-energy market. Policies such as feed-in-tariffs, tax credits, and capital subsidies have been offered for waste-to-energy in China, India, the U.S., and countries in the EU. The Government of India has recognized waste-to-energy as a renewable technology and it supports the technology through subsidies and incentives. The Ministry of New & Renewable Energy (MNRE) is actively promoting technology options available for recovery of energy from urban and industrial wastes. MNRE is also promoting research on waste-to-energy by offering financial support for R&D projects on a cost-sharing basis in accordance with its R&D policy. The aim of the landfill directive is to minimize landfilling within the EU so as to prevent and reduce negative effects of waste landfills on the environment and human health. These supportive regulations and policies of governments are propelling the market for waste-to-energy. The initial capital required to build a waste-to-energy plant is high. This is likely to restrict the market during the forecast period. According to the Waste-to-Energy Research and Technology Council (WTERT), a plant with the capacity to process one thousand tons of waste every day can cost between US$ 110 Mn and US$ 140 Mn to build. High initial cost is incurred due to several necessary equipment such as feedstock preprocessing equipment, storage equipment, digester, and energy generator. Municipal solid waste (MSW) plants can take several years to become financially beneficial. The initial cost of a digester is approximately US$ 600 per ton of annual waste throughput capacity. Average payback time for an anaerobic digestion project is more than five years. Thus, high initial cost of waste-to-energy plants restrains the market. The current population of China is approximately 1.38 billion. The country is followed by India and the U.S. Increase in population leads to the rise in solid waste generation. This, in turn, is projected to increase the supply of feedstock for waste-to-energy plants in the near future. Moreover, rise in the disposable income in countries such as China and India is directly proportional to increase in the per capita waste generation. This creates lucrative opportunities for the waste-to-energy market. These countries are expected to improve their waste disposal practices by reducing landfills and promoting waste-to-energy. This is likely to drive the waste-to-energy market in these countries in the next few years. In December 2018, Veolia Middle East, a subsidiary of Veolia, entered into an agreement with Sadara Chemical Company for construction and operation of a sustainable industrial waste-to-energy facility in PlasChem Park, an industrial park in Saudi Arabia. In October 2018, Veolia Australia & New Zealand, another subsidiary of Veolia, was selected to operate and maintain the first energy recovery facility i.e. the Kwinana project. The plant is anticipated to generate 40 MW of clean energy, which is enough to power 50,000 households. During the same period, Keppel Seghers Belgium N.V., a wholly owned subsidiary of Keppel Infrastructure Holdings Pte Ltd (Keppel Infrastructure), secured a contract to supply waste-to-energy (WtE) technology and services worth over US$ 80 Mn (EUR 70 Mn) to Australia's first WtE plant in Kwinana. In September 2018, SUEZ Recycling and Recovery UK, a subsidiary of SUEZ, confirmed its plans to build a new waste-to-energy facility near Billingham in Stockton-on-Tees, which is aimed to cater to the public sector and commercial customers in the North East and Scotland. The new facility, the third structure on the Haverton Hill site, has been permitted to treat 200,000 tons of residual waste every year. In April 2018, SUEZ was awarded a contract for a new waste-to-energy and material recovery facility by SICTOBA and SIDOMSA waste treatment agencies. The new 20-year contract, worth a total of US$ 98 Mn (EUR 80 Mn), includes design, construction, and operation of the future recovery facility, which is likely to become operational in 2020. In March 2018, Keppel Seghers Belgium N.V. and Keppel Seghers UK Limited (collectively, Keppel Seghers) secured two performance bonuses and signed a five-year technical support agreement of over US$ 9.8 Mn (GBP 7 Mn) with Runcorn Energy-from-Waste Facility. Europe dominated the global waste-to-energy market in 2017. Increasing government incentives, renewable energy targets, and rising investments in the biogas technology in the region are expected to drive the waste-to-energy market in Europe during the forecast period. In 2016 alone, 41 new biomethane plants were opened in Europe. 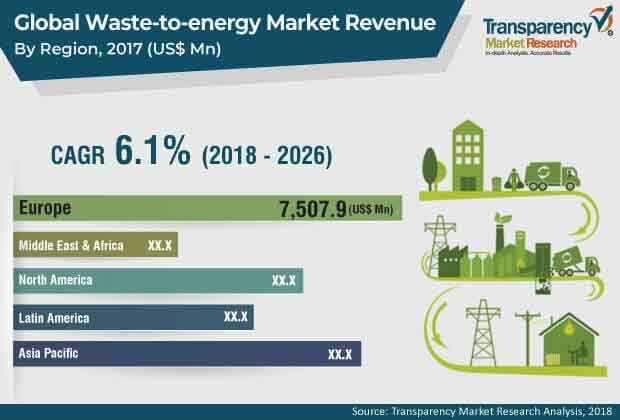 Moreover, the waste-to-energy market in Asia Pacific is expected to expand at a rapid pace during the forecast period. Energy consumption is on the rise in several countries in Asia such as India, Indonesia, Thailand, Malaysia, and South Korea. Rapid industrialization coupled with rising importance for renewable energy generation is expected to drive the market in the region during the forecast period. The global waste-to-energy market is highly fragmented. A large number of local and international players provide waste-to-energy services. Key players operating in the global market are Veolia, SUEZ, Covanta Holding Corporation, Keppel Corporation Limited, Constructions industrielles de la Méditerranée (CNIM), China Everbright International Limited, Babcock & Wilcox Enterprises, Inc., STEAG GmbH, Future Biogas Limited, and Gazasia Ltd.